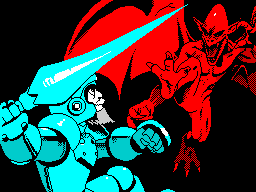 New ZX Spectrum loading screen for Ghosts'n Goblins. A few weeks ago, I had decided that I would go through some Spectrum games that had truly woeful loading screens and redo them, hopefully making them better. Along with is, my idea was to blog the whole creations from start to finish showing how I went about creating each loading screen. I decided to choose Elite's software's conversion of Capcoms Ghosts 'N Goblins. The game itself may not look pretty but played pretty aces. But the loading screen was awful. After 2 weeks off and on, I finished this afternoon, and here it is. 2 versions, one without the logo and one with. I can tell you, it's been a real challenge. And, here's a time-lapse animation of the creation of the loading screen. Re: New ZX Spectrum loading screen for Ghosts'n Goblins. This is very impressive work to anyone that understands the ZX limitations. However I am skeptical about the main technique used in getting over ZX limitations, which is dithering to hide the attribute clash. I would like to see much less dithering, more solid colors, even if this mean the piece being less colourful. If the ZX likes to think of 'paper color' and 'ink color', then why not adopt this point of view? Much more selected highlights over solid lineart and solid colors would look less impressive in terms of ZX demoscene skillz but perhaps it would convey the mood of the image better. This is not finished, of course, but you see what I mean? The end result of modern ZX technique is what I call 'nuclear holocaust colors'. Everything seems as if it's lit in lava and radioactive lightsources. Which is fine... but isn't it done enough? I realize what I am suggesting is a 'deevolution' of ZX technique, but I am suggesting that when you go back to how the ZX was built to display (cartoon-style, paper and ink color) and at THAT stage you use modern general pixel arty skills about tightening up pixel shapes and controlling what you can control as opposed to what you cannot, the end result might not look as flashy, but it will look *solid*. Solid is good. An 8-bit machine doesn't have to try to be something else than an 8-bit machine sometimes, it just has to be a good 8-bit machine. I see what you're getting at, it's food for thought. There is one problem with your quick edit, though, in that you have bright and non-bright pixels of the same colour which isn't possible with the ZX Spectrum attributes. The 2 colours in the 8x8 attribute both have to be bright or not. That means, for example, you cannot have an attribute with bright white and dull cyan or bright cyan and dull cyan. Therefore, the colours on Arthur's armour in your exit just can't work and that's where dithering comes in. The Spectrum games themselves were mainly done in mono because if the attribute display and as a 'culture' it was pretty much all we had, y'know? And that has always caused a 'backlash' as such with mono graphics, not that there's anything wrong with mono graphics, you understand. Redballoon, very nice screen. Awesome addition to original game. I'm always love all that new made screens for old good games. As for me - i'm always on the dark side of textures and dithering :-D, it is a modern way to draw for ZX, and it is easiest way to overcome the attribute clashing. It's funny you should link to that ZX Art site, which I'm also part of, and those examples you gave do show off the style he recommends....but have a look at the Top 100. You think I dither too much? but have a look at the Top 100. You think I dither too much? Do you make your art for getting in the tops of any page or are you doing it to learn something for yourself? You should also always question who chooses top pieces. If you always try to imitate only a small part of pieces some people liked you won't really make interesting experiences which brings your ability of doing arts really forward. From all the sites I know I have to say that "top pieces" aren't flawless and there is always something which can be improved. They aren't the best, but they were made the best and some of the artists themselves don't even understand it sometimes. If you look at it just from one perspective or you just accept only one established style there is a lot you won't even remark. Wow, ease up there. You've misunderstood my point! I was directing people to the Top 100 as it was easier to show the various styles including the dithering method used - not because I want to get into a Top 100!! Hmm after reading it again it sounded a bit harsh. I just wanted to point out that there are a lot of possibilities you may overlook. Linking to the site could help to find some interesting techniques though. Your current piece lacks atm a visual focus - helms edit is atm a lot easier to grasp, while it has a lot more cartoon-like influence. Imo the readability issues comes from overdithering some areas and the lack of some eye-leading lines and simplified areas which suffered damage through dither. redbaloon I was under the impression that pure black and pure white could be used with any bright or dull color, excuse me if I got it wrong. If I got that right, I do not think there's major errors if you slap an 8x8 grid on top of my image. Even if you take out the dull cyan from my edit, what I'm trying to get to still stands. Your further explanation about more mono-ish pieces versus nuclear meltdown superdithered modern piece is very understandable. I can help you with your current piece, I just do not think it's going to amount to much, it'd be nitpicking edits (mainly on the face of arthur) where the glaring 'fault' with the piece is an overcompression of information and lack of clarity, which is sacrificed to make the ZX look like it's achieving something it was not made to achieve. Which is what the demoscene champions, but we are in 2012 and these machines have been pushed to the limit for decades and now we can respect them also, I would hope. And make art for them that feels comfortable for them. I was under the impression that pure black and pure white could be used with any bright or dull color, excuse me if I got it wrong. I think the dark version of white is the grey you used for the beard, not sure though. its just Helms with the dark colors replaced with light colors with black dithering over them. That would work right? And it looks pretty much the same. I think the version in your first post is good, but I do agree with the comments here. I think it would be benificial to simplify the image a bit, to make it more immediatly readable, and give more of a focal point. It doesnt need to be as simple as Helms though. Maybe try highlighting the demon without dithering between the red and yellow and see how that looks; some of the dithering comes off as noise. The explosion looks cool, but the demon kind of blends in with it. The shading on the wing makes it hard too see.